We want to make agility more fun and accessible for everyone, not just for the serious competitor. 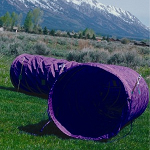 Now those who live in the city or travel frequently can easily do dog agility any time and anywhere. Karen Pryor Clicker Training - The leader in the field of non-coercive (all-positive based reinforcement) training techniques and an authority in the field of "clicker training"
Click Train - Another email list for the forum and discussion of clicker training.